In the interest of full-disclosure, I’d like to mention right away that Master of Malt sent me a sample of this whisky to review. Also in the interest of full-disclosure, I’d like to mention that I am a huge fan of Master of Malt. Rest assured that I was a huge fan of Master of Malt long before they sent me samples of their whisky, and will continue to be a huge fan even if they start sending me flaming bags of dog poop, which they might start doing after they read some of the posts I plan to put up later this month. 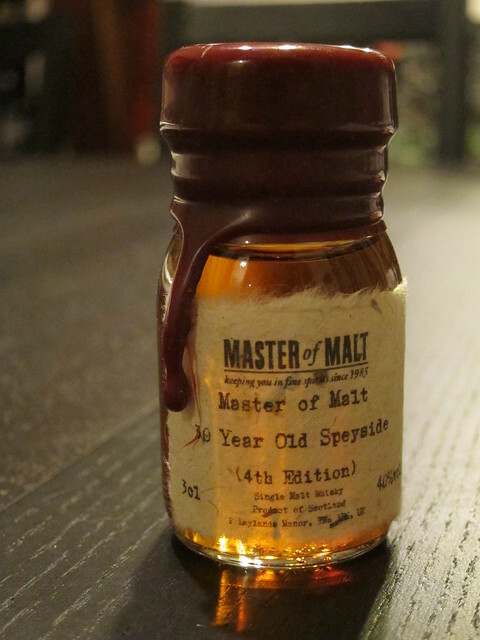 If you’re a fan of whisky and you don’t know about Master of Malt then you are in for a treat. If you do know about Master of Malt, then you already know what a great retailing resource they are and you can skip to the tasting notes section if you want. The company has been selling booze to folks since 1985 and today are one of the few non-US based online retailers that ship to the states, giving us poor saps in the colonies access to whiskies we might normally never see. They are also one of the few whisky retailers that sell a broad range of samples, fantastically packaged in wax-capped bottles with rustic, hand-printed looking labels, again giving people a chance to try whiskies they might not otherwise even consider. They do a great job, better than practically any retailer that I can think of, of not just creating an educational community around the spirits they sell, but of being really enthusiastically involved, of reaching out and participating with the serious aficionados and budding malt-heads alike, and of being creative in their approach to bringing people to the world of whisky. As a prime example, this year they sent out special blending kits to 10 fellow bloggers, who then each created their own blend. Master of Malt then sold samples of the blends and asked people to vote on their favorite with the resulting whisky now being sold as St Isidore’s Blend. If you’re seething with envy over not being one of these blogger blenders (bleggers? blonders? ), fear not…you can create your own blend with one of these fantastic little blending kits. Along with their own line of carefully selected, single cask bottlings from various distilleries, Master of Malt has produced several expressions from un-named distilleries representing the main Scotch producing regions. This 30 Year Old Speysider is the fourth edition of 30 year old Speysiders and like all their bottlings has no added color and has not been chill-filtered. The Nose: Wonderful honey-coated everything…winey, juicy raisins and baked apples, vanilla rice pudding and caramel sauce. All this lush sweetness is balanced nicely with soft notes of rich malt, smooth polished oak, and gentle spice hints of cinnamon, dried orange peel, and black peppercorns. Tucked in the background are fainter hints of tobacco leaf duskiness and sawn wood. The Palate: Luscious mouthfeel and even more honey and caramel to start, but quickly becoming more robust with darker sherry tones, burnt toffee, marzipan, and unsweetened cocoa. While the oak presence is strong, it’s not nearly as overwhelming as it could be for something this old. Requisite vanilla, cinnamon and clove notes are joined by a nicely honeyed, tannic oak quality that grows persistently on through the finish. The Finish: A wonderful continuation of the palate, this just slides into more drying, but still honeyed oak with dwindling unsweetened cocoa and spice. Thoughts: Beautiful stuff. Lush, just shy of voluptuous, a bit regal, and just enough “been around the block” to make for a dram you can sit and savor for the good part of a cold winter’s day. Rich, sherried nose leads into a really nicely developing, balanced and complex palate. You certainly can’t expect a 30 year old Scotch to be inexpensive, but for £99.95, around $153.00, this is a good value and a delicious way to try an older Speysider. Although I haven’t had this particular dram, I am in total agreement about Master of Malt. Their motto should be “We Make Whisk(e)y Fun!”.